Trust Ranveer Singh to do things differently. On Friday, the 33-year-old actor visited a couple of theatres in Mumbai to see the reaction his film Simmba is getting from the audiences. Pictures of Ranveer at the theatres and interacting with the cine-goers are all over the Internet. He even climbed up to the roof top of one of the theatres and posed with folded hands for his fans gathered outside to get a glimpse of Ranveer. The actor was accompanied by Simmba director Rohit Shetty. Ranveer wore a red jacket to complement with his black tee and trouser for the day out. Take a look at the pictures of Ranveer Singh aka Simmba. 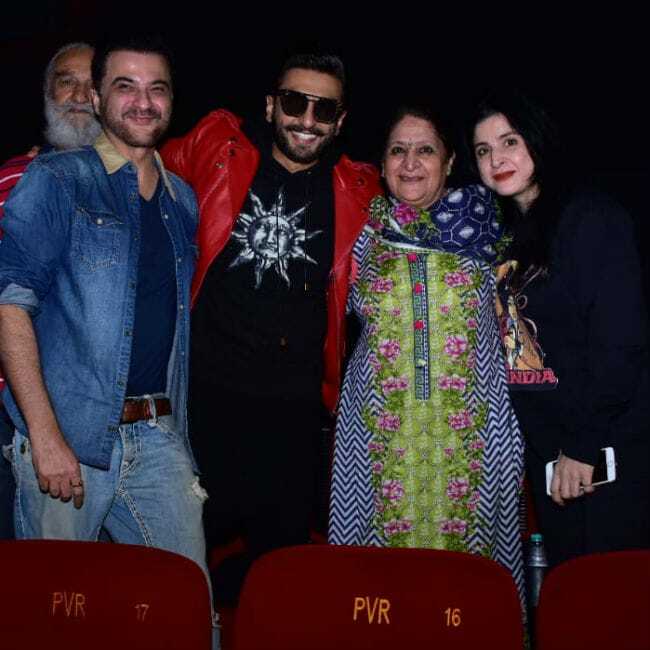 At the movies, Ranveer also met Sanjay Kapoor and his wife Maheep. Of his film Simmba, Rohit Shetty earlier told the press, "I am not saying that we have created something different but this film will give you a high. The film will make you happy and cry at the same time," news agency IANS reported. Simmba, also starring Sara Ali Khan, released to mixed reviews. Ranveer plays a cop named Sangram Bhalero while Sara stars as his love interest. "Ranveer Singh lets it rip with infectious enthusiasm. His energy levels come in handy as Rohit Shetty goes all out to deliver another exaggerated variation on the crusading cop theme. Sara Ali Khan receives short shrift. That's a pity," wrote film critic Saibal Chatterjee in his review for NDTV. Simmba is Sara Ali Khan's second film. She debuted in Bollywood with Kedarnath, which also released in December. Simmba also stars Ashutosh Rana and Sonu Sood in pivotal roles.